In both Bhuddhist and Brahmin Cosmological Pantheon, the four directional points of the compass have a Deity allocated to each direction. The deity allocated as the Lord of the North is “Taw Guwern” (Guberan), or more commonly known as “Taw Waes Suwann” (the word “Taw” meaning “Lord”). In Bhuddhist tales and Fables he is known by his Pali name Waes Suwann, or Waisarawan (Sanskrit).In both Thailand’s “Ramayana” and the original Hindu Brahmin Epic “Ramayana”, the name of this Being is “Lord Guberan” (Taw Guberan). Apart from this, The Lord of all Rich Fortunes and the Northern directions has other names, such as Tanesworn, Waisarawan, Yanksaraja, Raaksentorn, Ratanakan, and Aitawita (son of Itawata). Waes Suwann (Guberan) was the half brother of the ruler of Langka in Ramakian, Totsagan (Ravana).Totsagan stole Waes Suwann’s “Busabok” (movable throne/dais). Taw Waes Suwann is seen guarding the entrance to most Thai Temples, and is highly revered by Thai Buddhists as the lord of Great Fortune and Riches. Taw Waes Suwann is not a very common amulet to find in amulet shops, only being produced by very few temples, the most famous being perhaps, Wat Sutat, in Bangkok. 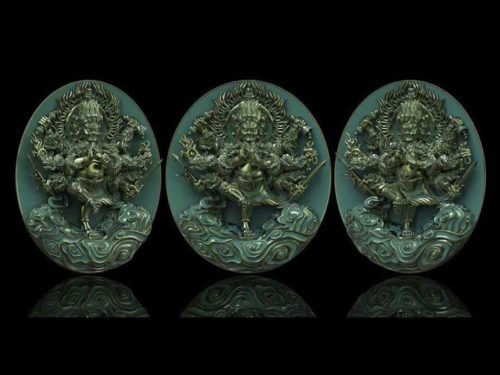 Taw Waes Suwann amulets are normally rare and often also rather expensive.Statues of this Deity are almost always placed in the gateways to Temple enclaves, and is seen as a protector of the Dharma. The Image of Taw Waes Suwann is found often printed on “Pha Yant” – Yantra cloths, with protective spells and imagery. This Pha Yant is normally obtained at the “Swod Pan Yaks” ceremony, normally performed after the rainy season when the monks can once more undertake their wanderings. The Yaksas are called in this ceremony, annd Taw Waes Suwann is called to reside in the Yantra cloth, to protect against all evils, Malevolent Beings and thieves, as well as to clean ones past Karma. There was once a Ruesi practising in the forest in the region belonging to Lord Dharawintu who went by the name of Bussattya. One day, as the Ruesi was practicing his abstentions and meditations in the forest, a group of celestial virgins belonging to Lord Dharawintu entered the area where he was practicing, and began to chatter and make a humdrum running around and laughing. The Ruesi Bussattya took great offence at their frivolous behavior and put a curse on them. “If any Maiden appears again in this my place of practise,she will instantly bear the fruit of her immodesty, and seem as if she has a secret lover, and have to live in shame. None of the Maidens returned to bother the Ruesi, until, one day, a Celestial virgin by the name of Itawita, who was the daughter of Lord Tarawintu (who knew nothing of the Ruesi’s curse), entered into the ceremonial area of the Ruesi in the forest, and itawita was instantly transformed into a pregnant woman. She instantly ran home in shock to told her father what had happened. When Lord Dharawintu learned of the events, he rushed to the Ashram of the Ruesi Bussattya, and offered him his daughter Itawita as wife and concubine, which Bussattya happily acccepted. Nang Itawita then gave birth to a son named Visrava, otherwise known as “Baolast” (or Lasataya), which means “he who is son of Bussattya”. After this Lord Visrava marrried Nang (lady) Tep Wananee, who in turn gave birth to a son named “Waisarawan” (Lord Guberan/Waes Suwann). According to Hindu Brahmin Cosmology, Lord Guberan is one of the Yaksa (Asura Giants) family, and has 3 legs, eight Fangs and four arms. His body is white in colour. As Lord Waes Suwann grew up and became adult, he left his father, and went to practise in the forest to improve his abilities. His advances were so great that the effects of his abilities reached the notice of “Phra Prohm” (Brahma), then appeared to Lord Waes Suwann. Brahma asked him “What gift or blessing would you wish for? i shall endow you with it!”. Lord Waes Suwann then asked for the power to Rule and dominate all the people in the world. Brahma replied that he was currently in the process of erecting the four corners of the Universe in order to take care of the worlds and spheres, and had already promised the Eastern quarter to Indra (Phra Intr, in Thai) Yama (Phra Yom in Thai) the South, and Varuna (Phra Warun in Thai), the Western quarter – Brahma suggested that he take the remaining Northern quarter for Lord Waes Suwann. In some cosmologies, the directions are split into eight; Phra Intr the East, Phra Plerng the South East, Phra Yom South, Phra Atidt SouthWest – Phra Pirun in the West, Phra Pay North West, Waes Suwann in the North, and Phra Jantr in the Northeast. Phra Intr (indra) also bestowed a magical mobile dais (chariot throne) to Lord Waes Suwann, capable of going anywhere the owner wished to. After this, Lord Waes Suwann went to rule the city of Langka (the city of the Yaksa in the Ramakian (Hindu Ramayana) Epic. previously, Langka had belonged to the Raghasasas (giants), but due to the fact that they once challenged the power of Phra Naaraayn (Vishnu), they were cursed by him and their culture fell into entropy. langka then became a ghost town and the Ragasasa fled and hid in the Badala realms (Mueang Badan in Thai), where the Nagas lived. This means that Lord Waes Suwann is the older half-brother of Totsagan on his father’s side.In that time Lord Waes Suwann was lord and ruler of Langka, but later Nang Nisa convinced Totsagan to overtake the rule of the city and take the power from Lord Waes Suwann. Totsagan was even shameless enough to steal his magic dais too.The magic dais was able to travel anywhere one’s heart wished, but there was a special rule; It was forbidden for a lady who has had three husbands to ride on the chariot/dais. One day, Nang Montoe (Totsagan’s wife), got on the chariot, and the thing came to a halt, it was no longer possible to be moved.Nang Montoe was first the consort of Palee, after which she became Totsagan’s queen, whilst married to Totsagan, the Monkey general of Phra Ram’s (rama’s) army, Hanuman, once shape-shifted into the likeness of Totsagan and duped Nang Montoe into sleeping with him.Nang Montoe is therefore considered to have had three husbands. As Lord Waes Suwann came to have to lose rulership of Langka, id caused Brahma to feel sorry for him, as he was such an honorable being, so the Deity conjured up a new City for Lord Waes Suwann, and Named the City “Wasutaraa”, or, “Wasusatalii”. This Mythical City is told to have been located in the Himalayan mountains. A second legend says that, after Lord Waes Suwann lost the City of Langka To Totsagan, he went to reside on the mountain of Khantamat (คันธมาทน์), which was a legendary and Divine place, with only beautiful sights to behold; there was a mystical pond as a place of Residence called Nalinii, whose water would spring up like a fountain and sprinkle down from the air like soft rain or a watery mist.The palace in the center of the pond where Taw Waes Suwann and the other Yaks lived was called “Pakalowadii”. The legend of Taw Waes Suwann is not only present in the Vedas of the Hindu Brahmin Tradition, rather it is also to be found in the Bhuddhist Pantheon of deities and legends too. There is a noticeable difference between the tales recounted in each Tradition. Before I begin to recount further, it is important to explain first that the Brahmin/Hindu Traditions maintain the belief in the idea that Deities (such as Lord Waes Suwann), possess an eternal self/soul, called “Atta”, which is immortal and immutable. The Bhuddhist Tradition, however, maintains the belief that all Deities and Devas are still subject to the law of Karma (and therefore also the chain of rebirth), and must have made some kind of meritorious deeds in the past, in order to have attained the blessings to enable them to ascend into the Celestial Realms (Heaven).These Celestial Realms, or Heavens, are then split into 6 divisions, or levels, beginning from the “Jadtumahaaraachiga” level.After this, comes the Dawadeungs Heaven, then the Realm of Yama, Dusit Heaven, and the Nimaanaradii, and lastly the Paranimidtawasawadii level of Heaven. Taw Waes Suwan resides in the Jadtumahaarachigaa realm – Jadtu means four in Pali – the four quarters of this realm are ruled by Asura Lords, of which Taw Waes Suwann is Lord of the North – Mahaa Raachigaa means a King of the Angelic/Deva status level – so the word Jadtumahaaraachigaa means; “Realm of the Four Celestial Kings”. 1. Taw Tadtaratha – Lord of the East 2. Taw Wirulabpaks – Lord of the South 3. Taw Wirunlahog – Lord of the West, and 4. Taw Waes Suwann – Lord of the North. According to Thai Bhuddist Legend, it is said that, far far back in Time, in the Era of the Buddha Gasayaba (the sixth of the seven Bhuddhas of the Past, and the third Buddha of the patara Kalpa), the humans lived for a length of 20 thousand years. Lord Waes Suwann was born in this kalpa (Aeon) as a Brahmin called “Guwen”, or Guberan. He owned a sugar-cane and sugar beet extracting business, with up to 7 branches/production stations. On the basis of conducting his sugar business, he became slowly a wealthy millionaire. He would always give all the profit from one of the seven production stations to the poor Folk. With the profit from the rest, he re-invested to expand the business and open more locations. All the money from all of the newly opened and constantly increasing in number locations was given to the poor people and localfolks, for a period of 20,000 years. Wisaana, giving him the Inherited name of “Taw Waes Suwann Taepabhut”. He was given the power to Rule over the assembly of Yaks (Asuras, also known as Yakkha, or Yaksa). He had an entourage of 9 Lordly Yaks; 1. Saatakiiriiyayaksa 2. Haemandtaayaksa 3. Apakawayaksa 4. Jidtasaetayaksa 5. Waepatayaksa 6. Maakabaatayaksa 7. Kamasaepabitayaksa 8. Kinubaatayaksa and, 9. Khantayaksa. Lord Waes Suwann also posesses another entourage consisting of an assembly of “Yakaratiga”, a lower lineage of Yaks, whose job was to patrol and keep watch over any incidents and occurences in the Realm, and to report it to the Lordly Yaks. Their highest comission they had was to keep watch and report over the doings, comings and goings of the Yak family, who sometimes would perform actions which disturbed those beings who were practising asceticism or Dharma and renunciation, and also bothering the Human world too. Some of the Yaks who gained fame in the legends for this kind of naughtiness were; Dtadtolaa Dtadtalaa, Dtadtoedtalaa, Oechalii, Dtaechalii, Dtadtoechalii, Sura, Raacha, Suroeraacha Aridta, Naemi and Aridtanaemi. Taw Waes Suwann’s magical club. Taw Waes Suwann’s weapon is traditionally the club (known as “Grabong” in Thai).This club is one of four supernatural weapons, namely; 1. the Vajra of the God Indra (called “Wachira” in Thai), 2. the eyes of “Phra Yom” (Yama), 3. the special cloth of Aalaawakayaksa and 4. the “kataawut” of Taw Waes Suwann (the club).This club has the power to be flung through the air and crack the heads of many thousands of Yaks in one single throw.Taw Waes Suwann was actually able to cause them to lose their lives, but in his mercy, would only ever crack their heads, in order to teach them to be better behaved.For this reason, Thai people tend to use Taw Waes Suwann statues and amulets to fend of Demons and malevolent beings, as well as putting a “Pha Yant” (Yantra Cloth) with his imaged imprinted on it along with some Kata in Khom script above the door of their houses to prevent thieves and ghosts from bothering. For dealing with those Yaks who were bothering yogis and Ruesi and Bhikkhus in their spiritual practises, Taw Waes Suwann created a special Kata (mantra), called “Aadtaanaadtiyaparittra” to control the selfish ones with. At that time, the Buddha was residing at Mount Kichagut in Rajgir, and Lord Waes Suwann paid a visit to Lord Buddha, along with a great number of his entourage of Yaks. In that time there were still some Yaks who were not faithful in the Buddha, who liked to bother the Bhikkhus practising in the forest, sometimes converting themselves into fearsome shapes and likenesses in order to frighten the monks and spoil their meditative practise. For this reason Taw Waes Suwann made an offering to the Sangha by giving them the Kata “Aadtaanaadtiyaparittra”, so they would be able to have dominion over thes Yaks when they became bothersome, or made an attack.When the Asuras would hear this Kata, they would run far away in their masses, for fear of, as well as respect for, the law of the Dhevas. They would not return again to bother once they had been driven away by this Kata. The Angels and Humans may revere and Bucha these Buddhas who asre endowed with great Metta which they send to release the Devas and Humans in heaven and on the Earth from suffering. May i offer reverence and Bucha to Pra Putta Jao Kodtama Kodtara, who is Adept with Knowledge Wisdom and Grace. The video below lets you hear the full version of Kata Taw Waes Suwan used in the famous ‘Suad Pan Yaks’ Ceremony to summon the Asura Kings, and beg their blessings. Taw Waes Suwann should also be revered by businessmen and financiers, and anyone who wishes to increase his financial and material wealth. Also in times of hardship and poverty, one should revere Taw Waes Suwann, which will enable you to have enough money to pay your bills and the cost of living with without any difficulty. Taw Waes Suwan is one of the Deities invoked in the Suad Pan Yaks Ceremony which is famous in Thailand for removal of bad karmic influence and cleaning black magic out of one’s psyche. Anyone who has attended a a Suad Pan Yaks ritual will know how mysterious and powerful the ceremony is, and have felt for themself how there is clearly something very real and very powerful happening. The items which devotees use in the Suad Pan Yaks ceremony to recieve blessings with include; Pure water, rice, wheat, sand, sai sincana cords, and a Taw Waes Suwan Yant cloth, which are then connected using the sincana cord which extend from the Yant that has been constructed on the ceiling (also using Sincana cords). Kata Bucha Taw Waes Suwan (Mantra for chanting to the Asura King of the Northern Jadtumaharachiga Kingdom – Lord of Treasures and Wealth, protector against demons, ghosts and malefic entities. The main Kata for chanting to Taw Waes Suwan should be chanted nine times. Always chant reverence to the Triple Gem before chanting to any other Deities.